What do you do with left-over paint? I am terrible at picking the right color when I buy paint even after comparing a gazillion paint chips and playing around with the color scanner at some of the stores. This means that I often end up with more paint than I need. 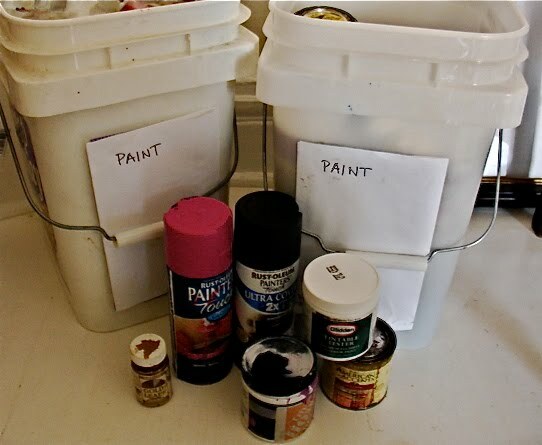 So if you are anything like me you have a few cans of left-over paint sitting around in your closet, underneath your sink or in your storage that you are not sure what to do with. (Thank Goodness for those new sample sizes that allows me to make smaller mistakes). Then the other problem that followed is that if I did no use the paint fairly soon it would begin to dry out. I created a spread sheet and wrote down what paint I had used for what wall, furniture or room – including the code that comes on the label. That way I can always get exactly the right color for touch ups or anything I would want to match. Like that. Hobby-paint, which often comes in 8 fl ounces, I keep in zip lock bags after I have tightened the lids. That keeps the air out and makes the paint last longer. Cat litter boxes. This of course, may require that you have a cat – if not any other fairly large plastic container or bucket with a lid works. Aycha’s litter comes in square buckets that hold 4-5 gallons – and can be piled on top of each other. I store all my paint in these. They keep the fumes away and make sure the paint does not dry. Trying to get the right color I have ended up with one too dark and one too light – but of they are both either water-based or oil-based I have just mixed the two together and gotten exactly what I wanted. Any paint that I don’t want or need goes to Earth911, Habitat for Humanity, Freecycle or Reuseit. The Earth911 is really cool as they can re-mix the paint and hen use it in your community. ← Painting a floor without sanding it – scary.